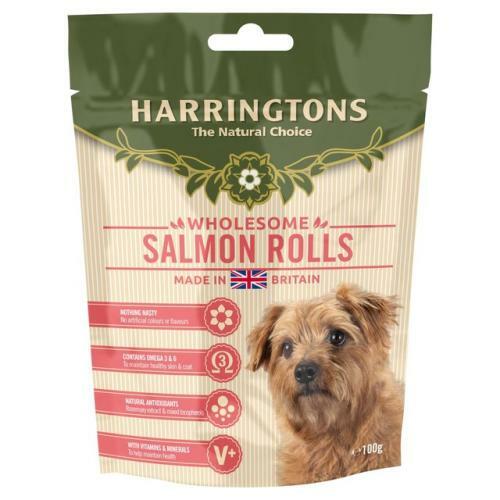 Harringtons have create a tempting treat for any dog with eager eyes. The natural healthy treat contains no artificial colours or flavours making them ideal whether you wish to reward good behaviour or teach a new trick. Ingredients: Salmon Meal (Salmon 26%), Rye, Oats, Glycerine, Rapeseed Oil (7%), Sesame Seeds (2.2%), Minerals, Flax Seed (1%), Parsley (0.4%), Rosemary (0.2%). Nutritional Analysis:Moisture 15%, Protein 23%, Fat Content 13%, Crude Fibre 1.5%, Crude Ash 7%, Zinc 150 mg/kg, Omega 3, 14,000 mg/kg, Omega 6, 31,000 mg/kg. Nutritional Additives: Vitamin A 10,000 iu, Vitamin D3 1,000 iu, Vitamin E (alpha tocopherol acetate) 60 mg, Calcium Iodate Anhydrous 1 mg, Cupric Sulphate Pentahydrate 5 mg, Manganous Sulphate 15 mg, Zinc Sulphate 315 mg, Sodium Selenite 0.15 mg. Antioxidant - (d-mixed tocopherols 500 mg - a natural antioxidant). Colours, Preservatives..